Through this service, DFS Accounting Services, LLC can provide daily, weekly, monthly or quarterly income and expense results along with total cash on hand. Track your income and expenses for a smooth tax season. DFS Accounting Services, LLC has assisted numerous clients in tracking income generated and expenses incurred from Fantasy Sports Playing, Sports Betting, Gambling and Cryptocurrency Investing. Through this service, we can provide daily, weekly, monthly or quarterly income and expense results along with total cash on hand. Individuals who incur expenses (i.e. cable sports package subscriptions, monthly advice column fees, investment research) use this service to make tax time smooth and seamless. 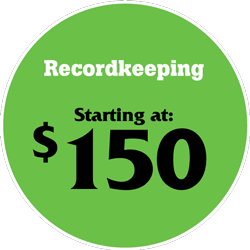 Our recordkeeping service fee is based on the volume of transactions required to be recorded and the frequency of the reports being provided. Should we determine the fee to be higher than quoted, we will advise you prior to performing any services. If you have more than 45 weekly transactions in QuickBooks, or need a customized quote for what we don’t have listed here, please feel free to reach out to us to discuss.